Are you gluten/grain-free and miss having a fresh out the oven brownie? I have always loved anything chocolate, so this recipe was quite a treat for me. 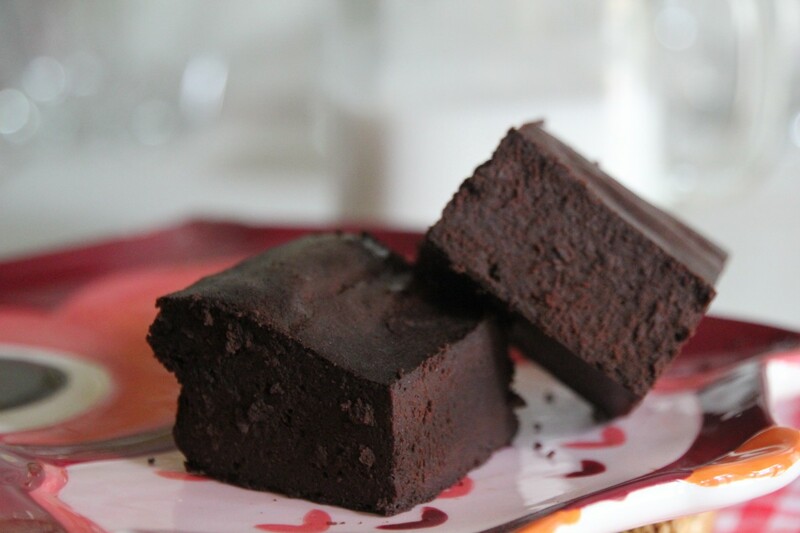 Now let me tell you, I have had my fair share of trying out Paleo brownie recipes, and none were good until this Flour-less Fudgy Brownie Recipe. How can you make it taste like a brownie without flour? Honestly, I have no idea because this recipe is so easy, but these brownies are DELICIOUS! I came across these ingredients one day on Pinterest and tried to recreate it. Not going to lie.. you are going to want to lick the bowl! Like I will say with all Paleo-ified foods, they are for special occasions! If you have a big sweet tooth and are always looking to Paleo-ify everything… This is not a good sign! If you eat clean, your body won’t crave these things anymore. BUT I do acknowledge there are definitely occasions for treats, and these flour-less fudgy brownies are much healthier than a store-bought brownie! These would be a great treat to bring to a party or get-together, because everyone can enjoy without feeling guilty! These are best served with a cup of almond milk (as pictured above). In the ingredients I give you the option of 1/4-1/3 cup of maple syrup! I personally made them with 1/4 cup because it tastes super sweet to me, and I enjoy the strong dark chocolate taste. But you are welcome to try 1/3 cup. Mix ingredients in a large bowl with a mixer or KitchenAid. Pour in 4 x 8 loaf pan. Let cool before eating, or place in fridge until cool (about 10 min). I made this maybe five minutes after i saw your recipe post! I used a vitamix to blend everything together. I also used a third cup of maple syup and the flavor was sweet but mostly chocolately. I stirred in some shredded coconut before baking and they were a big hit at my 4th party! These literally took less than ten minutes to prepare and get ready to bake. Defintely great for a last minute treat. Can you use stevia to sweeten them instead? What would the conversion be? I just made these using the 1/3 c. maple syrup and they are amazing! Very cakey, fudgey, and perfect. I cooked them for 22 minutes and they were great. Thanks for posting this! Great Sheila! Glad to hear it turned out good! Sounds like some great additions!! Glad you liked them! can i substitute the coconut oil for butter? Hello thanks for posting a great recipe. I find the brownies are dry actually. But because they are healthy I take that into consideration and like them. I added walnuts. That’s great, walnuts sound delicious! You over baked them if they were dry. The middle is supposed to to have a little jiggle to it once out of the oven. Well thank you for the feedback! Some people who still consume regular sugar may find they aren’t sweet enough. When you are completely Paleo and grain free they may taste a whole lot different! hi!!! i scoured the internet and found your recipe! LOVED it! everything turned out perfectly. it was moist and dense, just sweet enough for me, i also made some coconut milk and honey topping for them! either way! your recipe is perfect. thanks for posting it, i appreciate your creativity! Melanie, glad you liked it. Thanks for taking the time to comment! Thanks for taking your time to do so Melanie. OH MY! I must try these. Yes you must! And let me know how you like them! About to make these, I had no idea maple syrup was considered Paleo though? Would honey substitute okay? Either are not extremely paleo- these are paleo-ish brownies. Honey will do fine. Raw honey and 100% Pure Maple Syrup are 100% Paleo. Made these last night and they were great. I wasn’t sure it would turn out but it did – I added walnuts and only did a half batch (halved all ingredients). Even my non-paleo husband liked them. So glad to hear you liked them! Walnuts sound delicious, I must definitely try! Made these goodies yesterday!! And they are GOD sent..haha.Very easy to whip up,added a little less cocoa powder for the fear of tartness..Added blanched almonds,unsweeted coconut .Very moist.Thank you for the recipe!! I feel the same wayy! Such a simple treat when you need something sweet! These were great! So easy to make and they tasted great and I am a brownie junkie! With needing to eat better this is a great way to satisfy my sweat tooth without feeling guilty about all of the sugar and flower! Thank you it was awesome!!!! So glad you liked them!! They are great for a guilt free kind of treat! Can i use raw cacao powder instead of cocoa powder and get the same results? Thanks! Yes! Cacao is actually healthier! I enjoyed these. They are super simple, which appeals to me. I did not have coconut oil on hand and substituted almond butter, and quite enjoyed the taste! Also, for those that want a fudging or sweeter brownie, although I found these plenty of both, personally, adding a super ripe banana is a good addition! i prefer to use honey. how much should i use? Instead of honey and maple syrup, can I use cane sugar? And how much of it? Thanks in advance! I personally don’t ever use cane sugar so I couldn’t be sure! Probably 1/4-1/3 cup as well. OMG! Just made this with my 2 1/2 year old daughter and we LOVED it! It’s not too sweet like other brownies and really hits that spot for chocolate cravings. I used cacao powder and it turned out great. I wonder if I could sub avocado oil for coconut oil since the coconut oil was solid and I had to microwave it to liquefy it. My only complaint was that there wasn’t any leftovers! Thanks for commenting! I’m so glad you liked the recipe. You could most definitely use avocado oil. Fantastic! Substituted the Maple Syrup for Honey and…well, FANTASTIC! Can I substitute almond butter for coconut oil? I hate coconut oil and it seems to be in EVERY chocolate recipe! I made these with the almond butter. The flavor was amazing! But they did come out on the dry side. I need up cubing them and freezing them. Turned into a nice cold treat! My coconut oil is fairly solid (like soft crisco) but someone told me you should heat it to a liquid form before measuring. Is that true? I measured it as is before and it turned out…so, does it matter? Yes, I heat it to liquid form before measuring! It shouldn’t be too different, so it won’t make a huge difference. My hubby made these for me and they were delicious! He used coconut sugar instead of maple syrup and the top was slightly crunchy like regular brownies. I think he used one less egg as well. Sooo yummy!! I made these last night but accidentally over-baked them a bit, causing them to be dry. The flavor was phenomenal though! I decided that I would make a crumb crust out of the brownies, so as not to waste anything. When I pulsed them in the food processor the brownies didn’t crumble like I expected, instead they transformed into the most delicious whipped mousse-like dessert. It tastes like a dense chocolate truffle. I had to share my happy mistake! 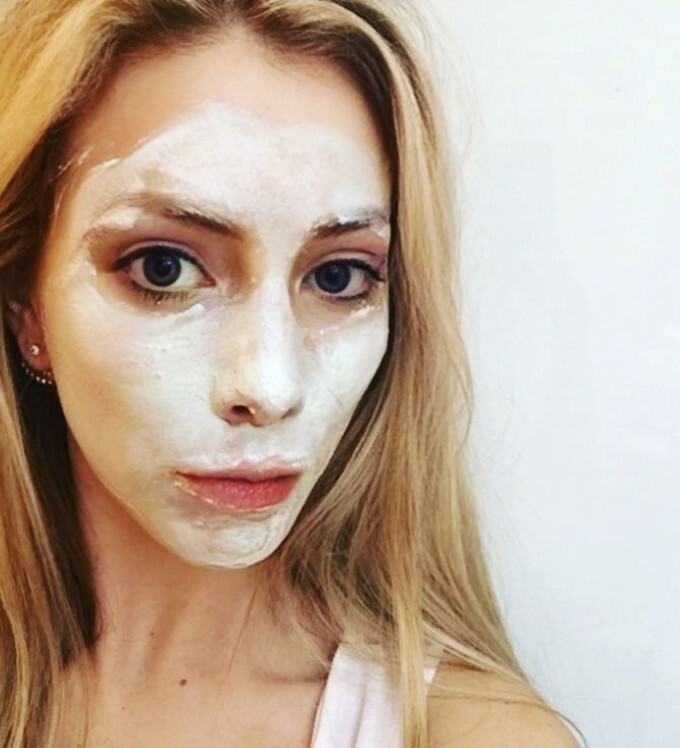 Amanda thanks for sharing, I really like the mousse like product too! YUM! I just baked these and they were to die for. I stuck to your recipe but added some little chunks of 80% dark chocolate and walnuts. They were loved by all who tried. Could I substitute another oil for coconut oil? I tripled this recipe and threw in a few chocolate chips. They puffed up beautifully in muffin liners. I think if I were to make such a big batch again I wouldn’t triple the eggs, they taste like souffles. So glad they worked out. Thanks for sharing! Love your website – is the coconut oil melted? 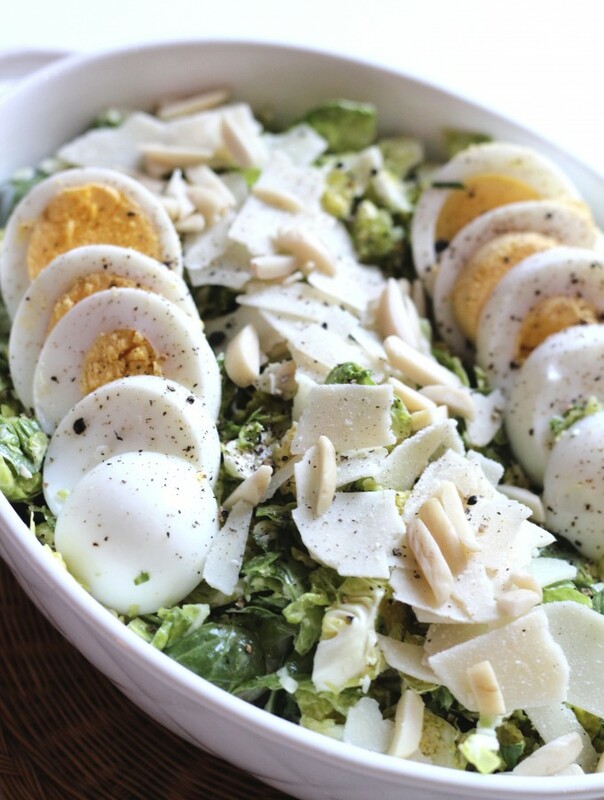 I can hardly wait to try your Brussels sprout salad for dinner tonight, thanks so much! Is the coconut oil melted in the brownies? I just want to know besides a 4×8 loaf pan what else can you use? You could use a cake loaf pan or anything really! Awesome!! I subbed cup of pumpkin purée for the syrup and added a scoop of cookies and cream cellucor protein. Loved!!! I ended up putting these in cupcake tins, they made 12 perfect average sized cupcake brownies. 15 minutes at 350 was perfect for my brownies! These are a very odd texture, they’re a little gritty from the cocoa (I hand mixed instead of electrically) but they’re very similar to those brownies that come in TV dinners, you know the ones that you’d be eating and there would be little corn kernels in the brownie because Banquet stupidly put the corn compartment right next to it? Either way, I think these are pretty interesting, and fudgy! I appreciate the recipe! I think these would be worth a try, however I’d definitely either add more sweetener or less cocoa if you like sweet brownies. Also I wouldn’t reccomend these if you’re looking to lower your cholesterol, these are all eggs hahaha. Haylee, one thing you have to understand is that when you go Paleo you cut back sugar severely. That means a little sweetness goes a long way since our taste buds change. So for a non-Paleo person who is used to sugary desserts it is going to taste more like bitter dark chocolate. Of course you adjust sugar easily. But just for you to understand these Paleo recipes, we who follow it cut back on almost all refined or added sugars so we are not going for super sweetness. A little goes a long way for us haha. I can eat dark 85% chocolate and it is sweet enough for me as I Hershey’s is now so sweet for me. 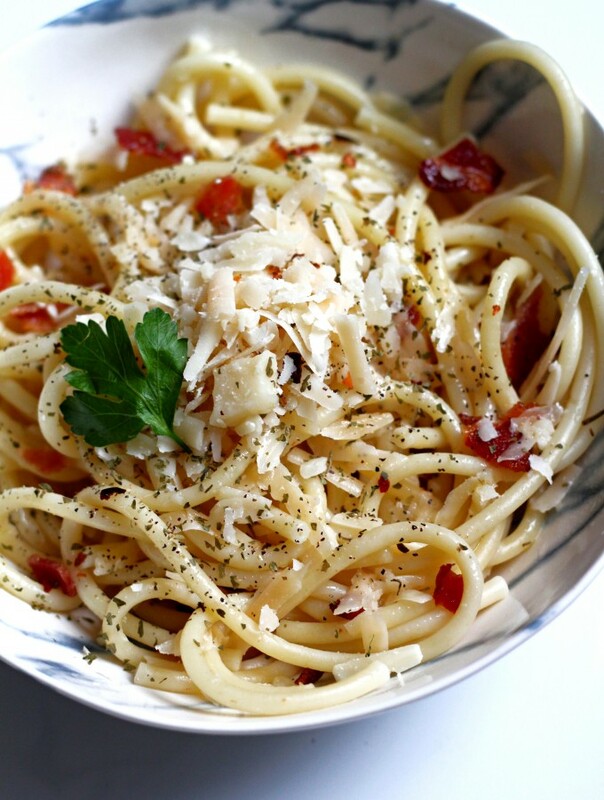 I am excited to try this recipe and add my own little tweaks as well! I totally agree Phil! Your taste buds change a lot after removing refined sugar. Let me know how you like the recipe. Love this recipe! Thank you. Awesome for paleo and my 2 year old enjoyed them a lot! Granted, she doesn’t eat sweets except for 90% Lindt dark chocolate so these were a big treat for us all. That’s amazing haha. Thanks for commenting. Your daughter and I would get along great. Thanks for sharing Sam! I’m so glad you liked them. And how interesting?! I may need to try them with an avocado too. Do you think it’s possible to sub the maple syrup with a healthier sweetener like apple sauce? Love love love love love these!!! Great! Thanks for commenting Gaby. These are great. I added a tbsp of cinnamon and a layer of crushed pecans in mine. Delicious. Yummy! Thank you! As a relative newbie to paleo and autoimmune diets, I have struggled finding something that would satisfy a chocolate craving. Licking the bowl after popping these brownies in the oven did the trick. I know you aren’t supposed to eat the whole pan in one sitting, so I plan to keep a couple in the fridge and freeze the rest in small single servings so I can enjoy sparingly but have something for those super weak moments. Also, I used mostly a quarter cup of yacon syrup and topped it off with a little maple syrup. Aw that sounds so delicious. I’m SO glad you enjoyed them! They’re definitely hard not to eat in one sitting, lol. Update: I made these again for my book club tonight. Added 1/2 teaspoon peppermint oil for a minty Christmas flavor. YUMMY!! I love brownies and best of all if it is chocolate so will definitely try this recipe – anything for a healthy version. Hi there. These sound delicious! What’s the nutritional content of these brownies – cal / Kj per brownie? You will have to type the ingredients in a nutrition calculator! I found it to be too dry by itself at room temp, but it was very good with milk. However, when FROZEN, it is amazing. Great low-sugar alternative to chocolate. I made these last night and they were absolutely delicious. Would like to know the calories and fat as I am on a Macro diet. Hey Marisol! I don’t provide macros, but you can use a macro calculator. Can I do this recipe in the microwave? If so, how much time would it take to cook? I do not have an oven, but I would love to try it out soon. Thanks! I haven’t done it but you could try! I’ll list the pros and cons, but in short, we liked these enough to serve to dinner guests! 2) They are really easy to make! 3) They contain five basic ingredients that we always have in the house—all of which are also easy to get organic. 4) They are really versatile! We’ve made them as cupcakes and as a small cake and topped them with various things, such as a light frosting, a peanut butter mousse, and even a light dusting of powdered sugar and fresh berries. 1) They are a wee bit dry, but again, with some moist toppings, that “problem” is eradicated. 2) They might be a bit on the dark-chocolate side for those who really feel they need more sugar; I personally eat 90 percent chocolate as a snack, so this was actually sweeter than the chocolate I normally eat. Quick tip: It may help to be sure the coconut oil is liquid first before you mix it with the rest of the ingredients. Not HOT, though, or it will start to cook the egg. Just not solid. Love the tips Sara! So glad you’ve been able to use this recipe. Great job on this recipe! 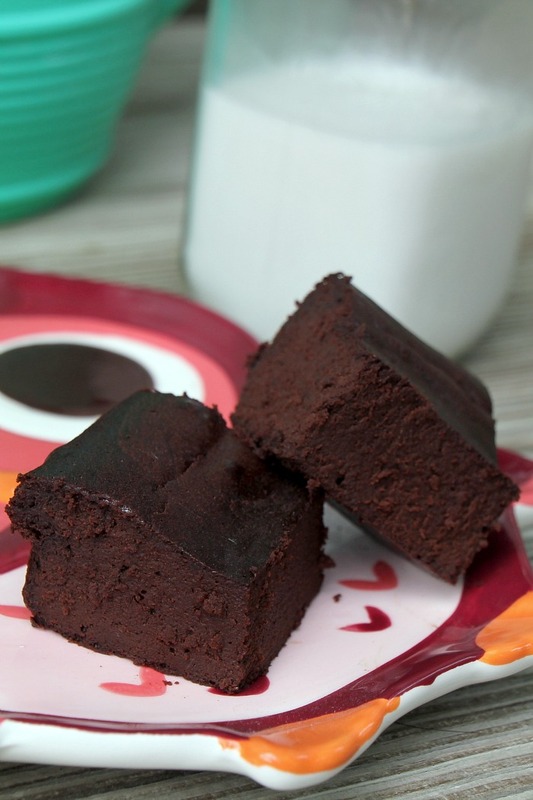 I have tried many Paleo brownies and none of them are this easy to make or this moist, fudgy and flavorful. The best I ever tasted. I’m just sorry I didn’t find your recipe sooner, Thank you. By the way I didn’t recognize who the face was behind the recipe until I got to the bottom of the comments. I really enjoy your articles, recipes and tips in the Paleo magazine. If the batter I licked off the bowl indicates the yumminess of these… I just found my new fav go-to chocolate fix. I only had 2 eggs in the house and I knew that my hubby would like something sweet later..but not too sweet and not too many carbs. I just adjusted the ingredients accordingly and popped them into a small loaf pan and right into the oven. Hope they came out great Annie!